For our Brown Bag night, each guest was instructed to bring a fat quarter of quilting weight cotton (i.e. regular fabric). After the demo, each guest made two Simple Bows. One went home with them. Then they clipped the remaining bow onto a Brown Bag for someone else to take home! In other words, everyone went home with two bows; one they made themselves, and one somebody else made. Fun, no? A number of you have expressed how much you wish you could have come to the October 2011 Brown Bag night. I wish you could all come too! 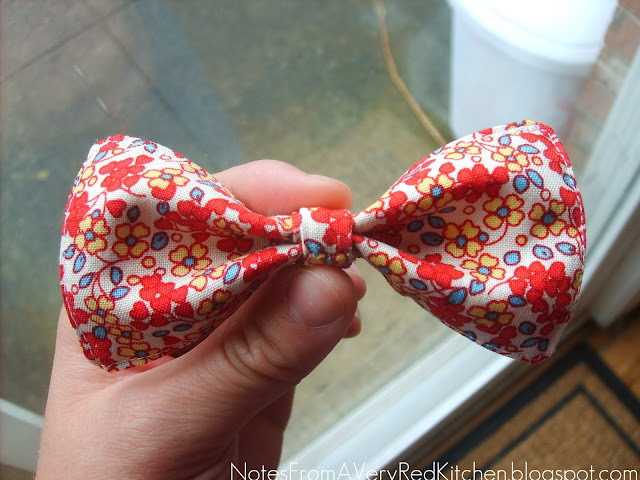 But because my house is too small to hold all of us and because so many of you live far away from me, I thought I'd let you in on the action with a little tutorial on how to make your own Simple Bows. 2 pieces that measure 3" x 5"
1 piece that measures 1" x 5"
*Note: I used regular quilting weight cotton for most of the bows I made. 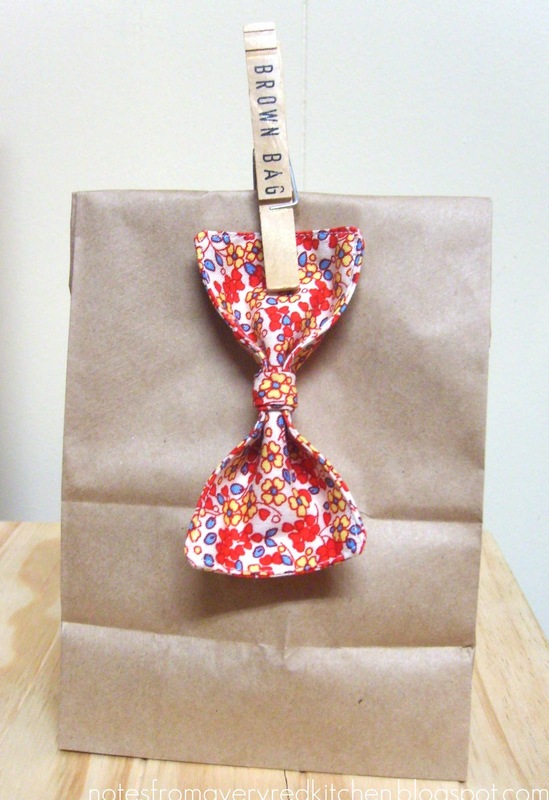 However, the ladies who came to the Brown Bag night brought a variety of fabric types and all of them worked well. 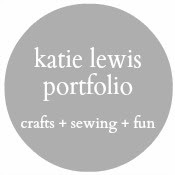 So be brave and try these out in different kinds of fabric! Step 2: Place your 3" x 5" right sides together. 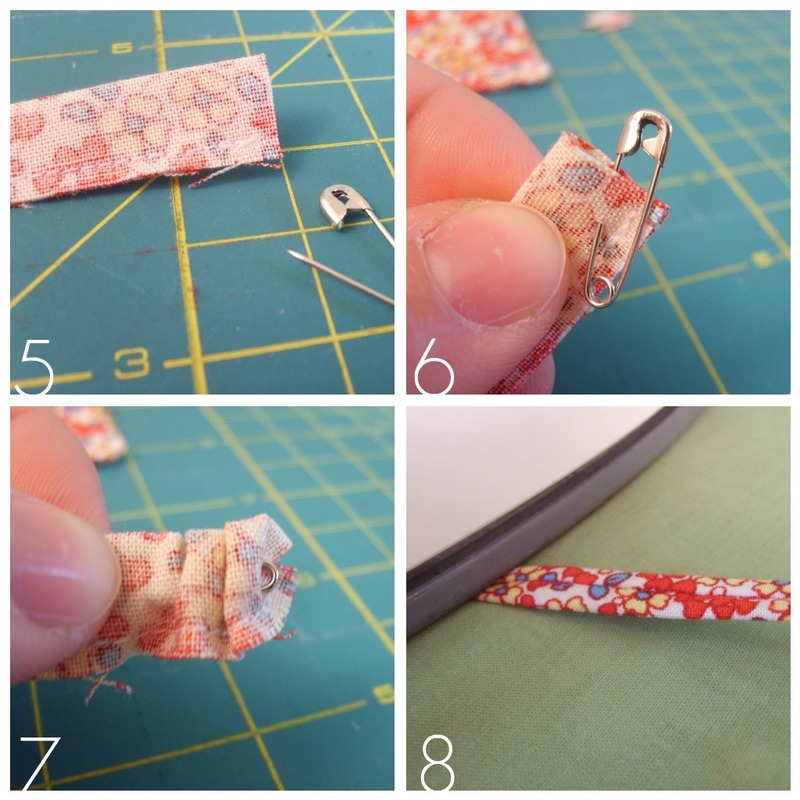 Sew around the edges using a 3/8" seam allowance. Be sure to leave a 1"-2" opening on one side. 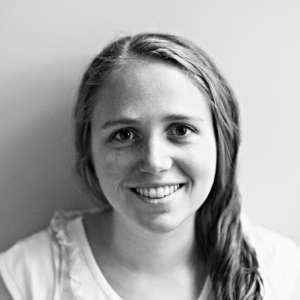 Turn your little rectangle right side out. Poke corners out with a crochet hook, chopstick, or whatever's handy. Press so the edges are nice and crisp. Step 5: Fold 1" x 5" strip in half lengthwise and sew using an 1/8" seam allowance. Step 6: Insert safety pin. Carefully pull safety pin through the strip, little by little, until the safety pin pokes out the other end. Step 8: Press strip with seam in the center. If the ends of your strip are ragged from turning it right side out, snip off the raggedy part so your end is nice and straight and doesn't loose threads coming off. 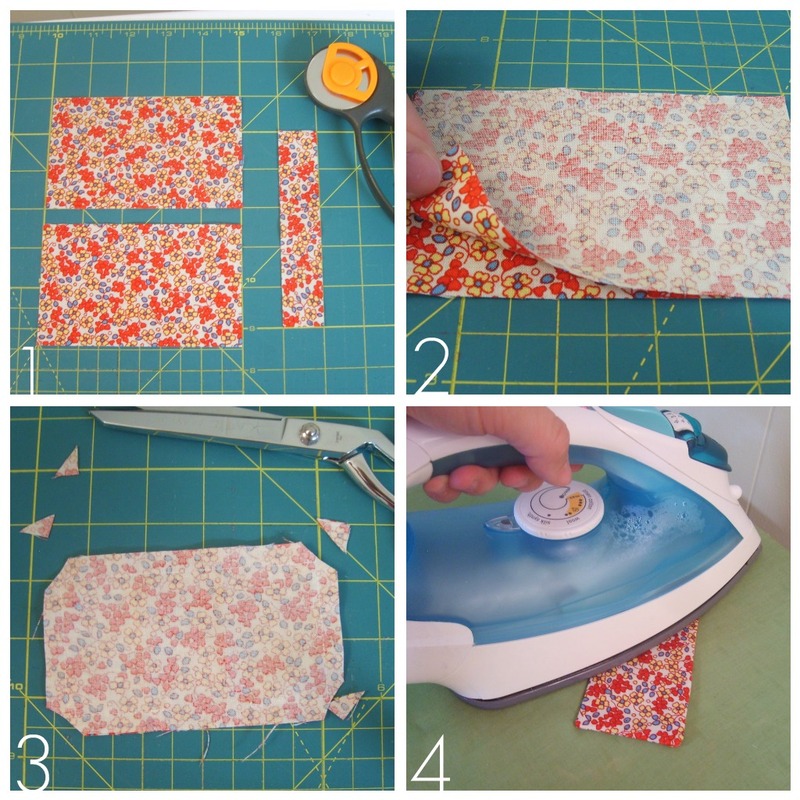 Fold the end of your strip over about a 1/2". Center the folded edge of your strip on the backside of your rectangle. Fold the center of the top edge of your rectangle down to meet your stitching line. Fold the center of the bottom edge of your rectangle up to meet your stitching line. Ta-da! It's looking like a bow! Step 11: Wrap strip around bow twice, keeping the strip snug next to the bow. Fold the loose end of your strip under about a 1/2". 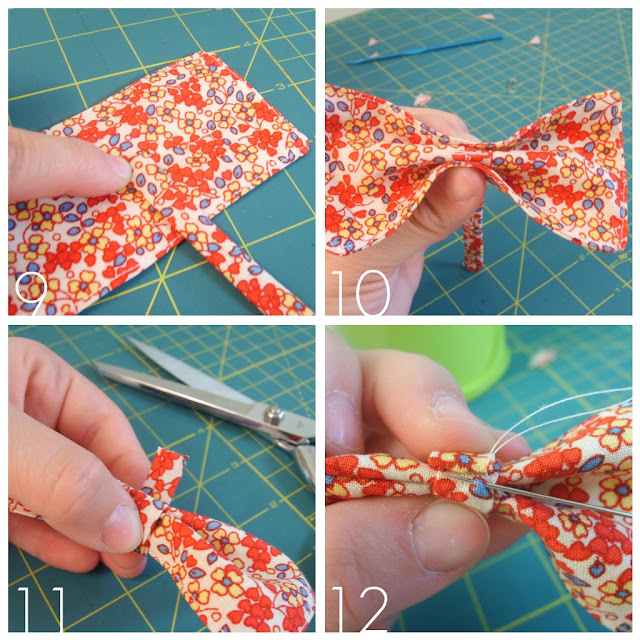 Using a needle and thread, stitch the folded end of your strip to your bow. Slip an alligator clip through the strip in the middle. These work great for hair clips and bow ties! 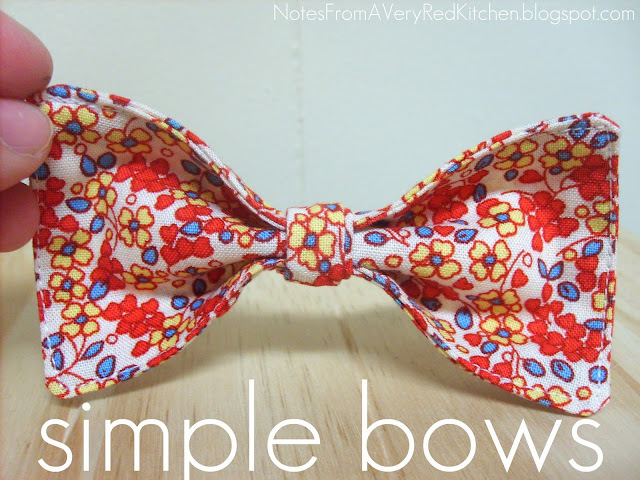 If you make any Simple Bows, be sure to share your pictures in the Flickr group! We'd all love to see what you make! your bows are so cute katie! Thanks for sharing. My daughter is going to be Dorothy for Halloween and I think some little blue gingham bows would be just right in her hair!